It’s great soap (of course!) and has been curing for months so it’s wonderfully hard, but it’s just not perfect, so I wasn’t happy selling it. Anyway, there’s only so much ‘reject’ soap that we can get through at home, so I decided to offer it for half price on my Facebook page. I had absolutely no idea it would prove so popular. I went off to a dentist appointment and forgot about soap for a while, and when I came out my notifications were going crazy and they were all sold no time. Why on earth has it taken me so long to do that? On Wednesday I sent off my application for the largest Christmas fair around here, the Portmeirion Winter Fair. It’s held on the first weekend of December, and I had a great (and profitable!) time there last year, so fingers crossed I can return this year. 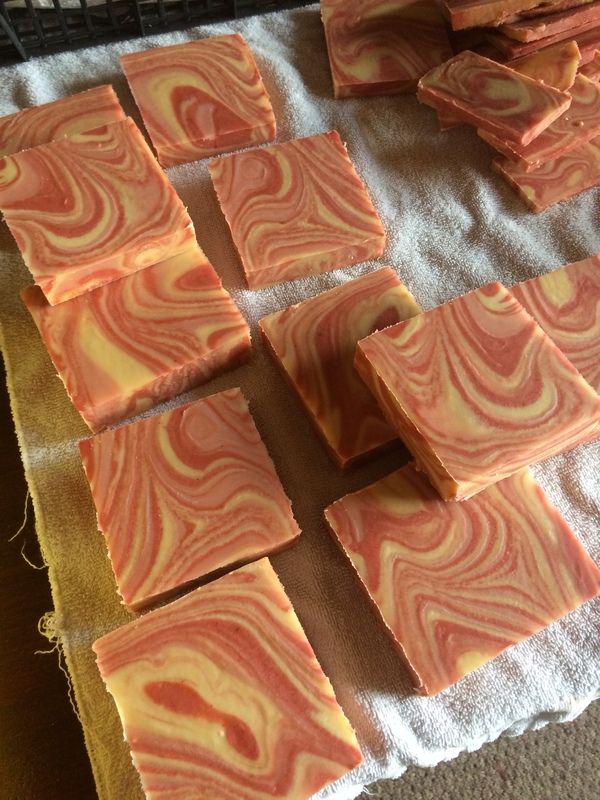 Thursday was soapmaking day – woop! 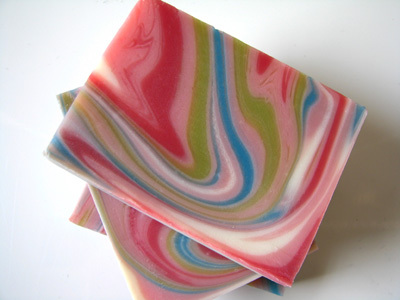 I made 4 loaves (60 bars) of my most time-consuming bar, the seven colour Tutti Frutti, scented with a jelly beans fragrance oil. 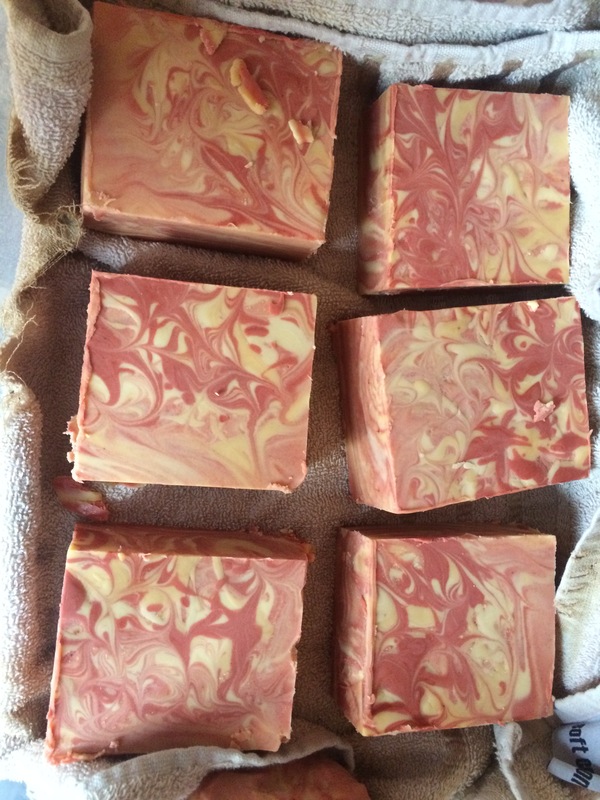 I also made a batch of my luxury Facial Bar, in my tall ‘n’ skinny mould from The Moulds Shop. Nope, I’m not on commission, I just love their moulds :-D.
I am ridiculously, utterly excited about this facial bar. I’ve been using it myself for months, to the exclusion of anything else, and I absolutely LOVE it. I don’t want or need anything else. It’s been tested by many others, and the feedback has been amazing, so this batch is the first that I’ll be offering for sale, probably in mid to late August. It’s got some wonderful ingredients, including evening primrose, sweet almond, jojoba and argan oils, and I’ll be writing a post about it closer to the launch date. Thanks for reading, have a great week, and I’ll be back soon! It’s been a quieter week on the soaping front. I was grateful for that to be honest – we had family visiting for the first half of the week, and I’ve been getting into the swing of Blogtober. Day 9 today, almost a third of the way through the month already!! The new wire for my cutter arrived on Tuesday, and it would appear I ordered the wrong one again. AARRGGHHH It was a coiled string (?) and slightly thicker than I expected it to be. Well, we fitted it onto the cutter anyway (taking a bit of a risk but by Wednesday morning I had 12kg of soap to cut and I couldn’t risk it getting too hard) and although it IS a little too thick, it did the trick. I did a bit of research and discovered that I probably need 20 gauge wire, so I’ve ordered some and it should be here soon. What a flippin’ palaver! 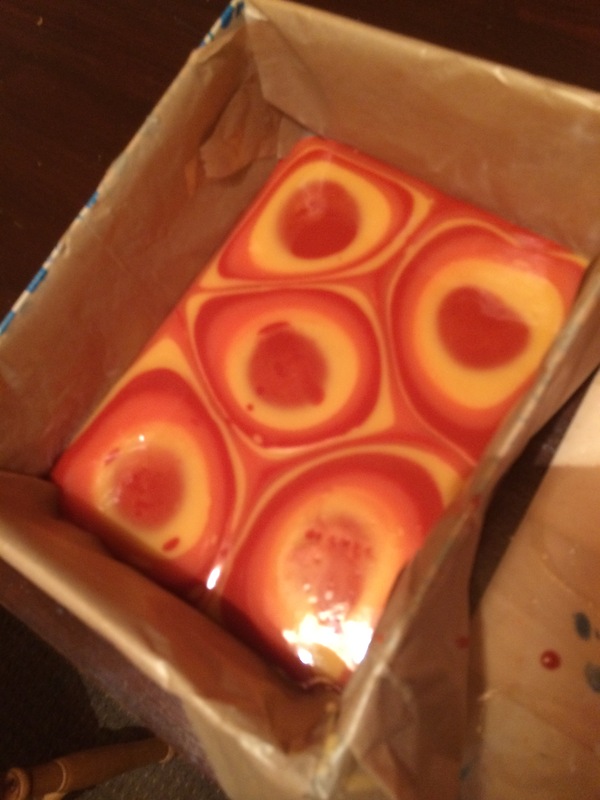 On Wednesday evening I gave my regular weekly soapmaking presentation. I can’t tell you how much I enjoy giving these. It often turns into a bit of a conversation rather than a ‘talk’ and I get to indulge in waffling on about my favourite subject to a captive audience. AND then I get to sell them soap too! I’ve only got another two or three weeks to go before they stop for the winter, but the manager has already asked me to go back next season – hurrah! Thursday was another completely soap free day, and Friday was spent in the office, cutting soap, labelling soap, wrapping soap, photographing soap etc etc…. I’ll be back tomorrow, come what may, hopefully with a clearer head and body that’s more willing to co-operate!! The colours aren’t quite right this time – the mountain needs to be more grey, and the greenery needs to be more, well, green… but I’m getting there. 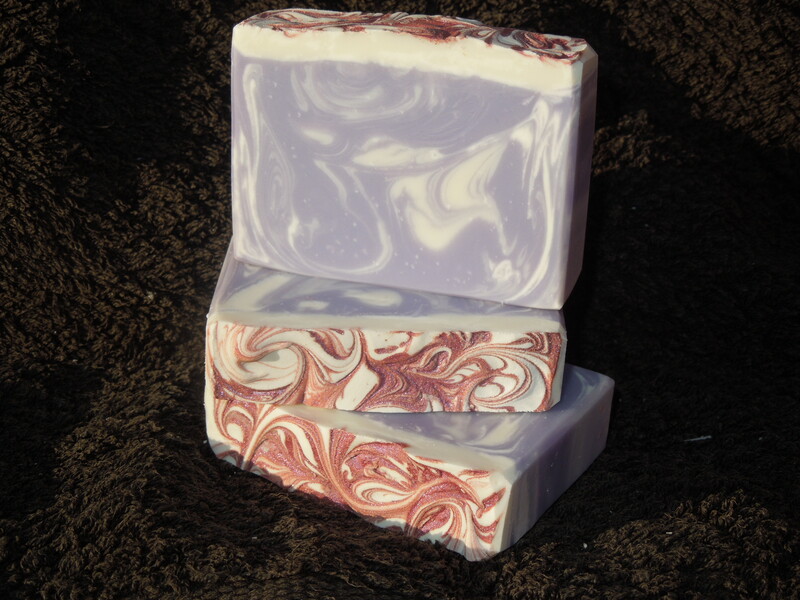 It’s fragranced with a blend of essential oils including rosemary, peppermint, eucalyptus, lemon and patchouli. One of my soaps used to make me a little sad. It smelled divine (no, I know I say that about all of them, but trust me on this one…) but it just didn’t sell well. It’s fragranced with a dupe of Aquolina’s Pink Sugar perfume: think candy floss, caramel, vanilla blended with strawberry jam and musk with top notes of lemon drops and brown sugar. It really is lovely. I became convinced that the reason it wasn’t selling was because of its name: First Kiss (so called because it’s so sweet, *groan*) It was cheesy, and the feedback was that it wasn’t something that older people would want to buy as a gift, even if they liked the scent. I needed some help to come up with something better, so I asked the good folk of Instagram, and was lucky enough to be given load of great suggestions. The one I went with was Sugar Drops, suggested by @nightwingbeth. I liked that it still implied sweetness, and also referenced the Drop Swirl design. So there we go – First Kiss has been relegated to history, step forward Sugar Drops. Thanks for reading, back soon! The last week of the school holidays didn’t give me much time to devote to the business. I made some soap, wrapped a few bars and uploaded a few items to the pending website and had one, massive, disaster. But more of that later. 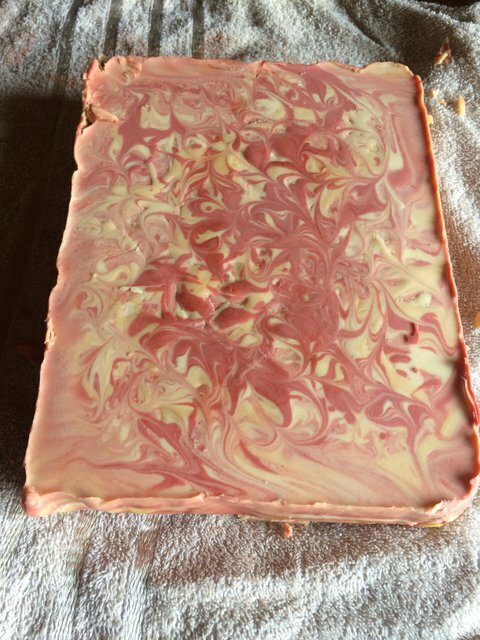 It smells delicious, and I really want to use this FO to make a drop swirl bar for Christmas, so I’m going to have to use all the acceleration-reducing tools in my arsenal – and keep my fingers crossed!! As I’d already made a start on the Christmas bars during the previous week, Candy Cane, Star embeds for the Christmas Tree bars, and a couple of batches of Dinosoaps, I’m confident that I’m on track time-wise. And that disaster. Urgh… I was making more of the Yr Wyddfa (Snowdon) soap. The last version was ok, but the bars weren’t uniform enough and the mountain itself didn’t really reflect reality. I intended to use the sculping soap technique (I was recently reminded of it by the incredibly creative Danica of Seife und anderes – if you like soap blogs you really should check it out), but the soap batter riced on me in seconds. I’ve used this fragrance before (and besides, the testing notes say no acceleration) so I REALLY wasn’t being reckless. Thanks for reading, back very soon! I had an inkling August would be busy. I hadn’t planned on posting often on the blog, but abandoning it for a whole month really wasn’t on the agenda either. The kids have been on holiday of course, but the soap business doesn’t stop for the summer (if anything it is busier than any other time, bar Christmas) and I’ve been frantically juggling childcare and keeping on top of the business for the last month. It really doesn’t seem right thinking about Christmas in August but last year I got caught out when retailers wanted Christmas stock in store right after Halloween (eek!) so this year I’ll be better prepared. These are the Viennese Fingers, which get their own photo because, frankly, they were bloomin’ delicious. Excuse the wonky one – only three were entered – that wasn’t one of them! If anyone wants the recipe let me know and I’ll post it – it’ll give me a great excuse to make more!! It’s been a great month, but things will be getting back to normal here over the next few days and I’ll be glad to get back into a routine – the blogging schedule will be back on track – I promise! Thanks for reading – all being well I’ll be back tomorrow with my goals for September. 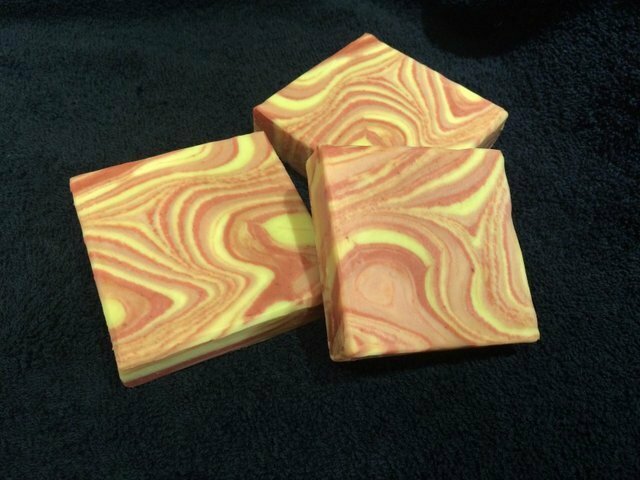 There’s been a lot of interest in my rainbow drop swirl (Tutti Frutti) soap recently, so I thought I’d put together a little pictorial tutorial for anyone who’s interested in how it’s done (I really, REALLY should start making videos shouldn’t I?). I generally make soap at room temperature, so I’ll mix up the lye solution in advance and put it to one side to cool down (I don’t discount the water for this one). I’ll also melt the hard oils and butters and combine them with the liquid oils and butters and allow them to cool down to room temp. Next I add my fragrance oil to the room temp oils and butters. Many people add their fragrance AFTER adding the lye and tracing the soap, but my preference is to add it before. I then add a couple of teaspoons of the fragranced oils to each jug of mica and get them well blended. I know it’s common practice to skip this stage and simply add the traced lye batter directly onto the powdered mica (or add the powdered mica directly to jugs of traced batter), but I don’t always use a stick blender and this way I know I can get the colour incorporated well just by giving it a good mix with a spatula. 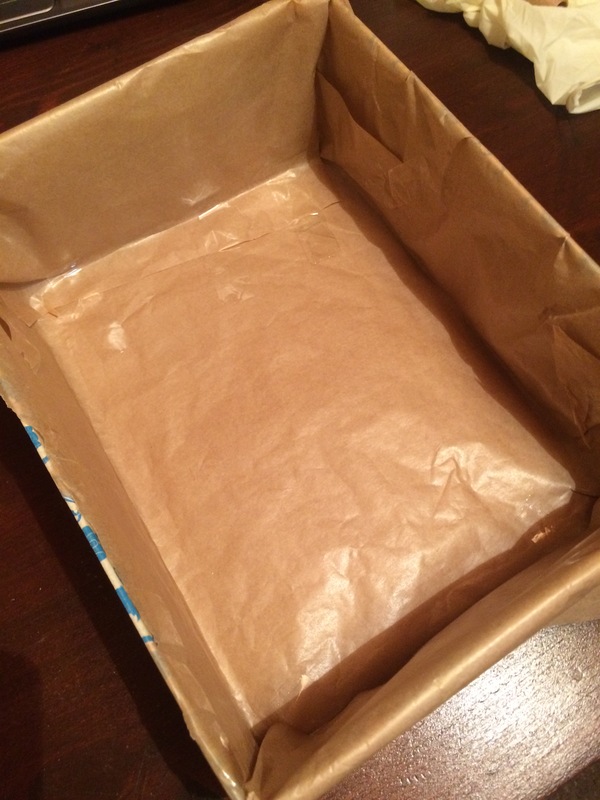 And then we’re ready to go… I mix the lye water into the tub of (already fragranced!) oils and butters, and share the soap batter out equally into the seven prepared jugs. It would appear I forgot to get a photo of that stage – sorry! 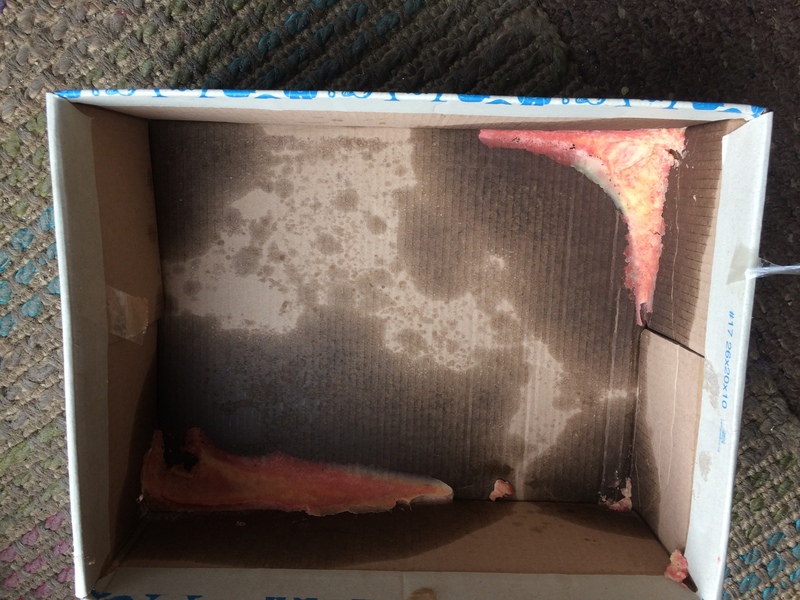 What we’re looking for is a really light trace as the soap will thicken up during the pouring process. Personally I don’t stick-blend this soap AT ALL. 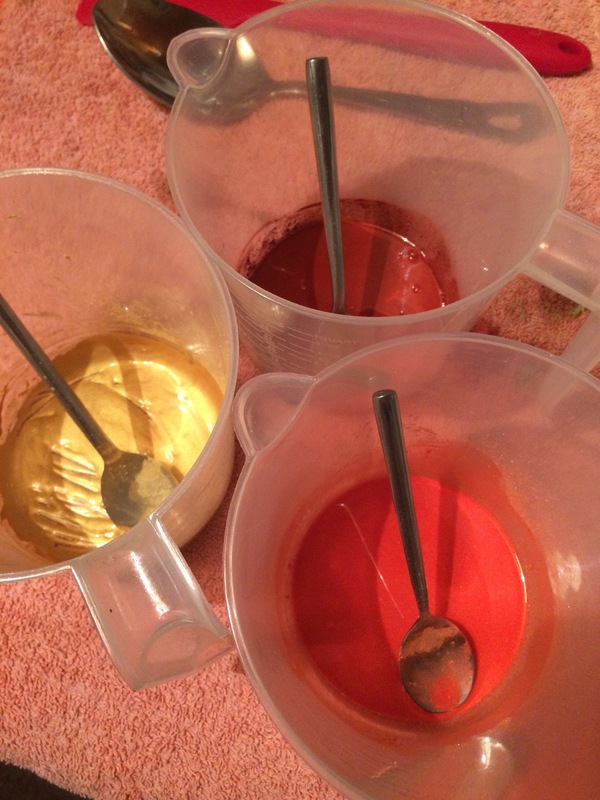 I find that by the time I’ve mixed up all the colours thoroughly it’s already at a light trace, but this will very much depend on how quickly your particular soap recipe traces and which fragrance you’re using. I’ve even found that certain micas can inhibit trace, so there are many different factors involved. It’s a case of using your judgement and, to be honest, trial and error. 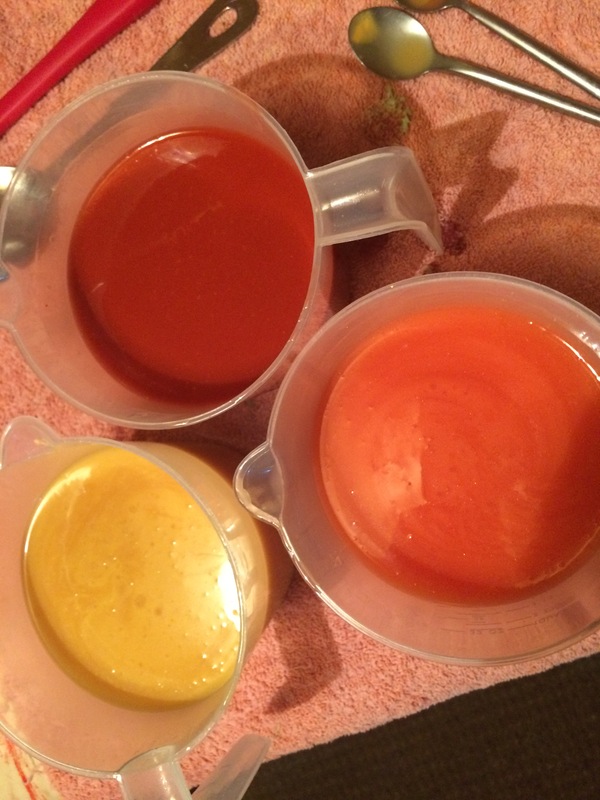 I try to make sure I pour from the jugs in the same order on each round of pouring, and also try to make sure I’m not pouring a colour on top of the same colour in the mould. And that’s it. It’s cured for 4 weeks, bevelled and tidied up, cured for another 2 weeks then released for sale. As I was putting together yesterday’s ‘Wet Soap Wednesday on a Friday’ post, I was thinking about how much I like soap tops, and remembered that I’d done a post a while back about them. When I went looking, I was surprised to find it had been almost two years ago: Soap Tops from November 2014. I was also struck by how different those tops were to the way I do things now. So today’s post is a quick round up of my favourite soap tops from more recent times. I’d be lying if I said every single batch looks like these, but I do tend to add a lot more texture to the tops than I used to, and I think I prefer them that way. I guess it’s about time I revised my header photo!! Note the rounded corners – I hadn’t yet discovered the joys of silicone liners lol… You can also see the signs of a partial gel here too. Thanks for checking in – I really do hope to be back soon with those 2016 goals! I prepared my colourants. The fragrance oil is described as a creamy, powdery, honey fragrance, and I wanted warm colours to reflect that. I used Radiant Gold mica, Sicilian Orange mica and Red iron oxide and mixed them with a little of the oils (to which I’d already added the fragrance). Many thanks Amy for organising the challenge! It was a real pleasure to try something new and I’m looking forward to seeing what the other entrants come up with.